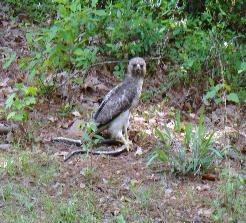 This red-tailed hawk had just caught a black snake and was unwilling to give it up even though I was near. She finally flew off with it when I got too close. However, the snake was too heavy and she couldn’t reach treetop height. She dropped back to earth several yards away in denser woods. I didn’t pursue her, hopefully she enjoyed her meal. The hawk made what she thought was a life or death decision and not only survived but lived to feast on fresh snake. I wonder if there is a moral to this story.